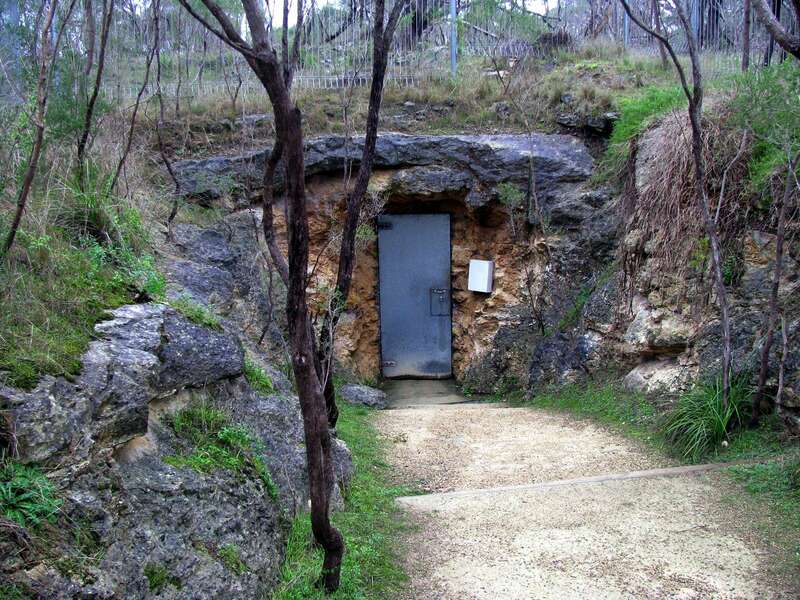 Naracoorte Caves in South Australia is in an area of limestone in which ground water has dissolved some of the limestone, creating the caves. 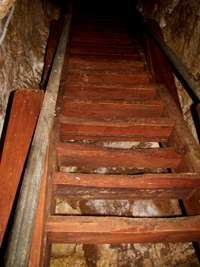 The caves are often not far below ground, and holes opened up creating traps for the unwary. 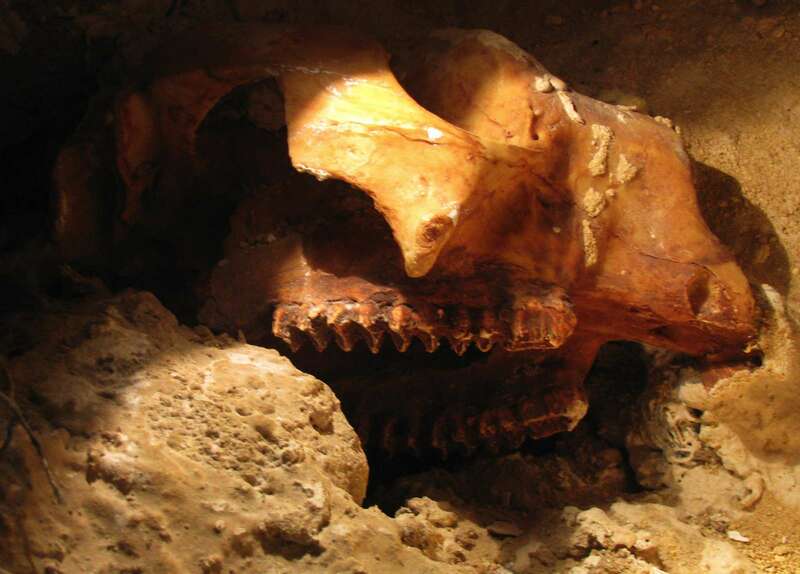 This is the source of the remarkable collection of fossils. 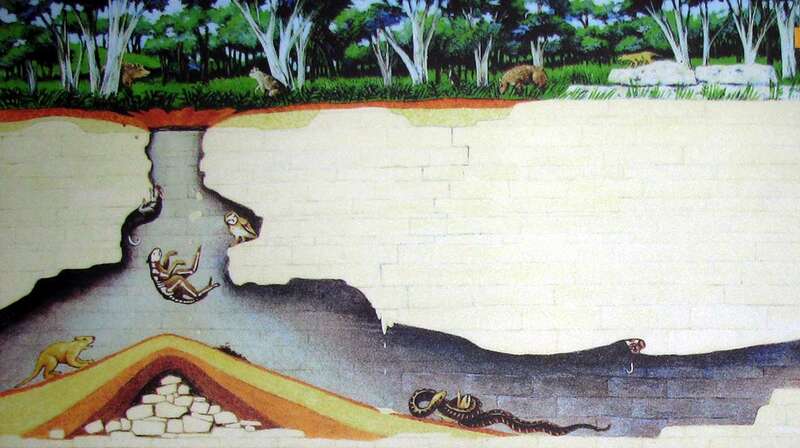 Mammals and other land creatures have fallen into the sink holes and been unable to escape. The fossil record has been preserved in strata formed from eroded topsoil washed and blown in. In some places, the fossil-bearing silt is up to 20 metres thick. Some of these areas are being preserved for future research when better methods of dating and reconstructing fossil records may have been found. These fossil traps are especially significant for tracing Australian megafauna. This series of paintings is an excellent explanation of the way that the Naracoorte Caves have become such an important resource for the study of extinct animals in Australia. Stage One - Formation of the cave and sink hole, and the first fossils are created. 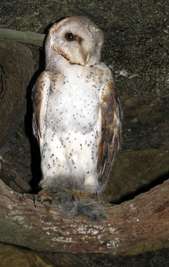 Some animals use caves as shelters or roosting sites. 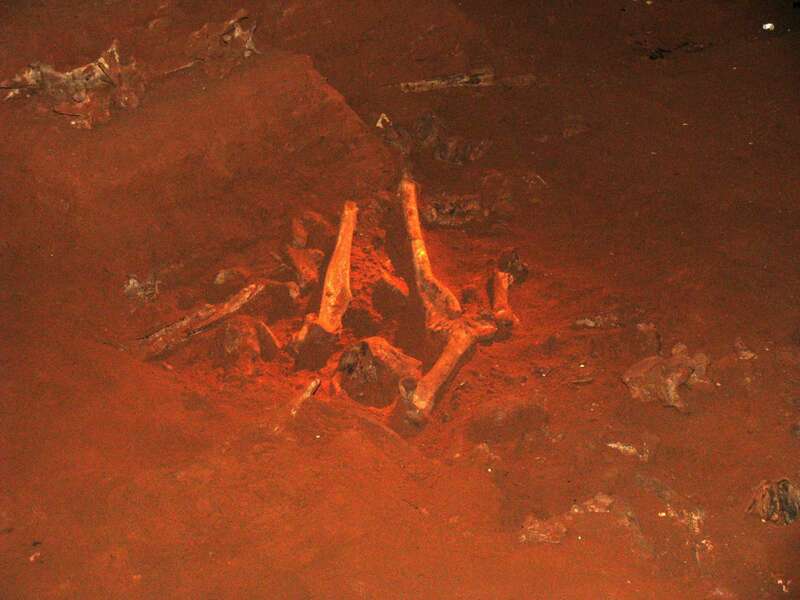 When they die their bones collect in the sediments on the cave floor. 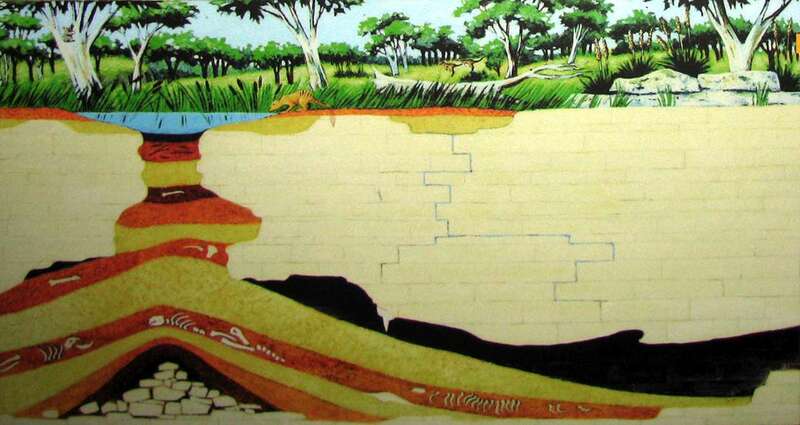 Cave entrances are often concealed by vegetation, and act as pitfall traps for unwary animals like kangaroos and large extinct herbivores such as Diprotodon (a large wombat, the largest ever marsupial, a member of the order Diprotodontia) and Zygomaturus (the swamp cow, also a diprotodont). Starving to death, their carcasses are soon buried in the cave sediments. 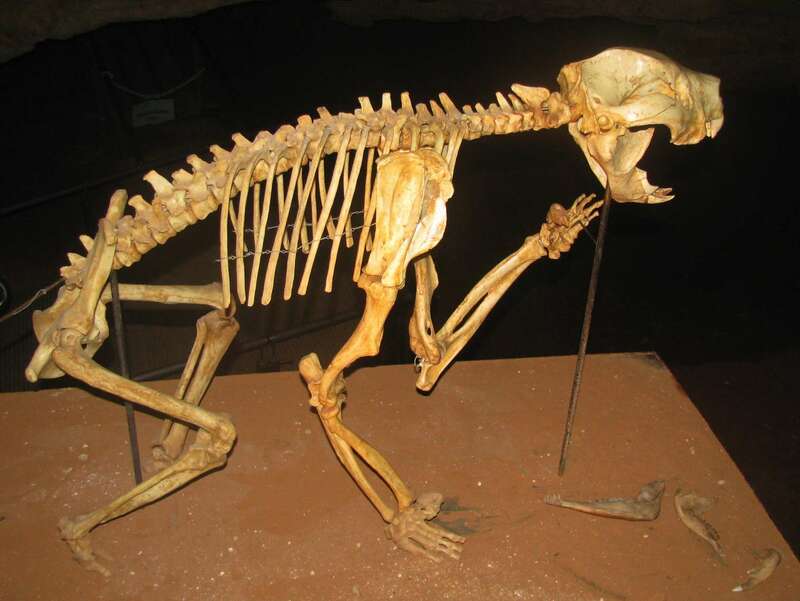 Some predators such as owls and the Tasmanian Devil use caves as roosts and dens respectively, where they bring their victims to eat, leaving the bone scraps to accumulate on the cave floor. Stage Two - Many more fossils are created. Eventually the sink hole fills with accumulated sediments, and a water filled depression covers the former pit trap. Over time, sediments and plant litter are washed and blown into the open cave entrances, burying the bones below. These sediments build up layer by layer to form cones which eventually block the entrances. 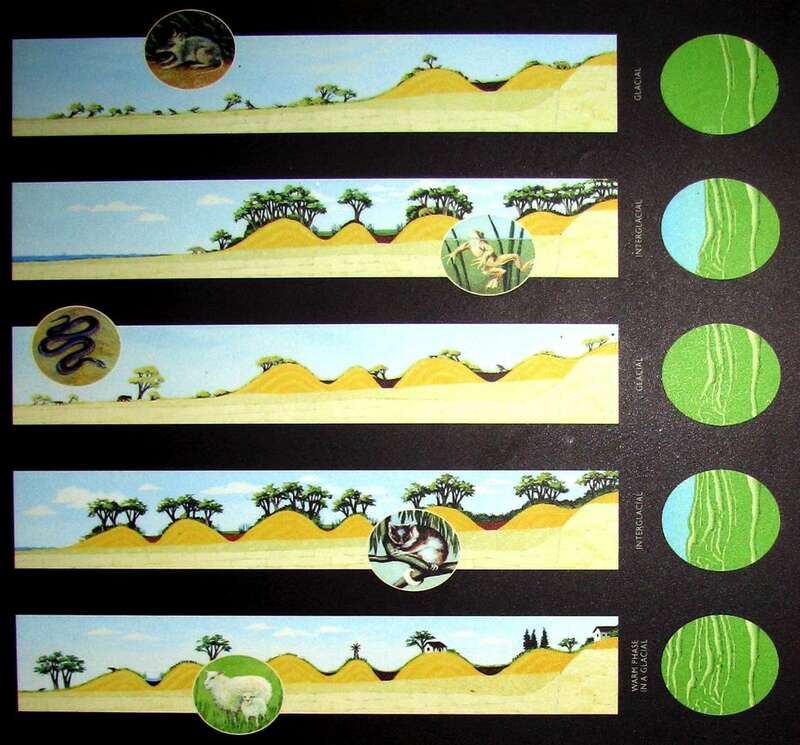 The different colours and textures of the sediments preserve a record of ground conditions that existed outside the cave at the time of deposition. 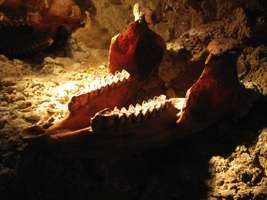 The bones preserve a record of the animals that lived close to the caves during that period. Stage Three - The Pit Trap Reopens. 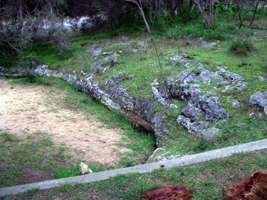 Water collects in circular depressions (dolines) above the blocked cave entrances. 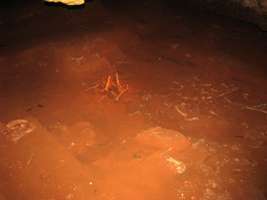 Eventually the upper portion of the cones may collapse under the weight of saturated sediment, unplugging the entrances. 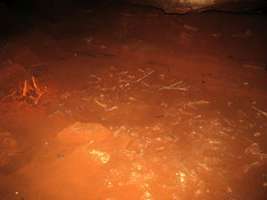 Masses of muddy sediment and bones slump and are washed down the sides of the cones to be redeposited deeper into the caves. Rain water flowing into the oen cave entrances may also redistribute the fossil remains. 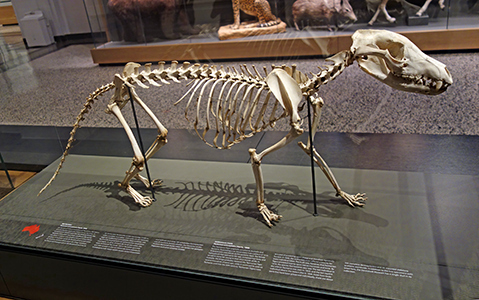 As a result, most of the bones of the original skeletons are separated from each other, or disarticulated. Bone and sediment from different layers and times are moved and mixed together. The entrance to Victoria Cave was last blocked by sediment about 16 000 years ago. 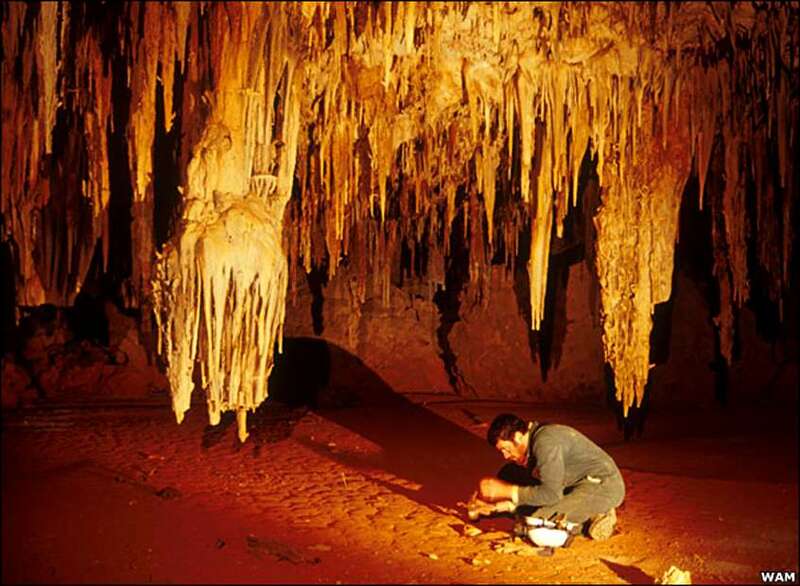 In October 1969 two members of the Cave Exploration Group of South Australia squeezed through a tiny passage about 30 cm high to discover this previously unknown chamber. One of the cavers wasa palaeontolgist who immediately recognised the significance of the deposit. 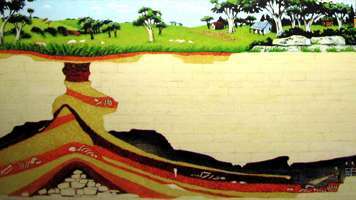 The fossil deposit in Victoria Fossil Cave is approximately 60 metres long and 20 metres wide and reaches depths of three to four metres. 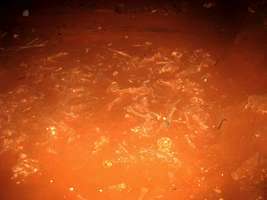 It contains an estimated 5&nsbp;000 tonnes of bone and sediment. Victoria Fossil Cave is only one of many such caves at Naracoorte. Pathways have been extended to the fossil bed ad visitors can now view the palaeontological dig in the company of a National Parks and Wildlife Site Interpreter. 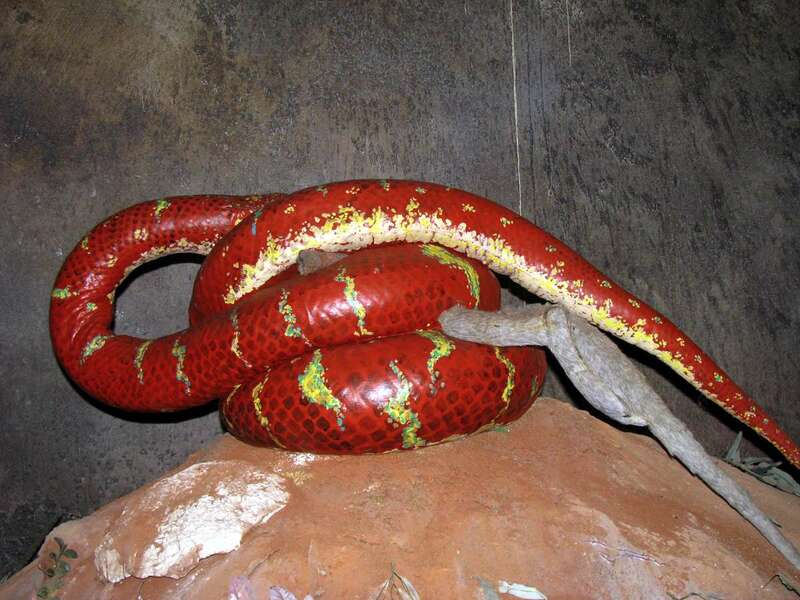 Wonambi naracoortensis was a large boid like snake that grew to a length of 5 metres. This snake killed by wrapping its body around the prey and slowly tightening the coils until the animal suffocated. The dead prey could then be swallowed whole. The Boidae are a family of non-venomous snakes found in America, Africa, Europe, Asia and some Pacific Islands. Relatively primitive snakes, adults are medium to large in size, with females usually larger than the males. 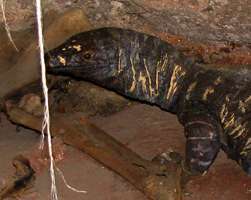 The name is derived from the Latin term bos, meaning "cow", and is based on an old myth that boas pursue cows and suckle them until they are drained to death. Two subfamilies comprising eight genera and 43 species are currently recognized. Varanus varius is also known as the Lace Monitor or Common Goanna. It is a large, mostly arboreal lizard that can grow up to two metres in length. Its diet consists of insects, reptiles, small mammals, nesting birds and sometimes carrion. 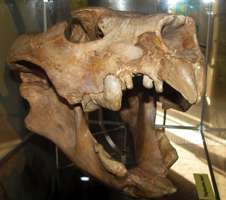 The largest of Australia's extinct marsupials, Diprotodon australis was once widespread and relatively common over much of the continent. 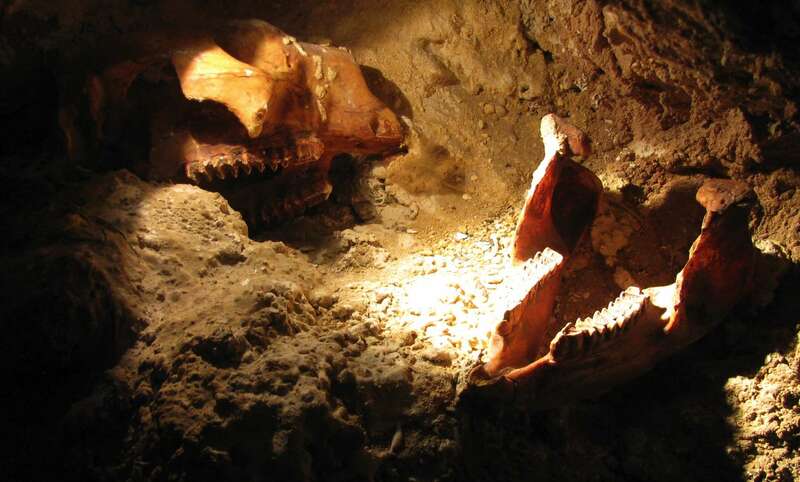 A large Diprotodon weighed 2 - 3 tonnes. Sthenurus occidentalis was a leaf-eating kangaroo, about the size of a modern grey kangaroo. The Sthenurine kangaroos did not survive beyond the last phase of glacial aridity, about 18 000 years ago. During the Pleistocene period the Giant Koala, Phascolarctos stirtoni, occupied the same arboreal niche as the modern koala, Phascolarctos cinereus. Phascolarctos stirtoni was larger than the modern koala by one third. The giant koala has been extinct for about 18 000 years. Palorchestes was a ground dwelling marsupial that possessed powerful forelimbs and razor sharp claws. They were capable of ripping through tough vegetation such as bark on tree trunks in order to obtain food, just as Black cockatoos today use their powerful beaks to rip open the bark of trees to dig out large grubs. 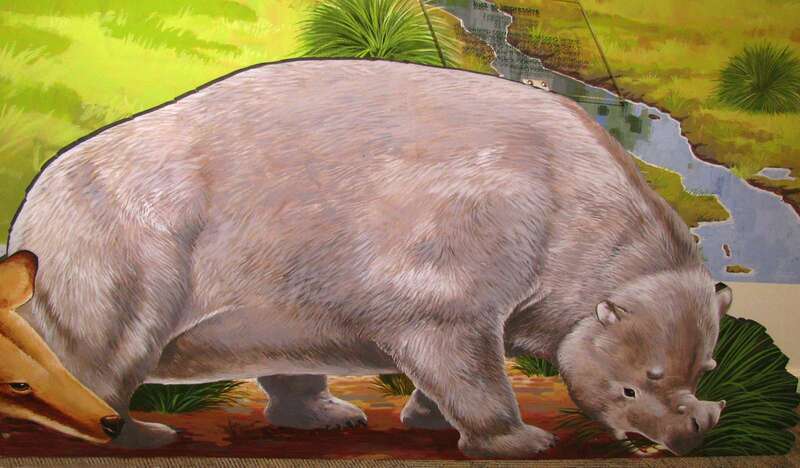 Zygomaturus trilobus was a herbivore and most likely lived in small herds around the wetter, coastal margins of Australia and sometimes along watercourses into central Australia. 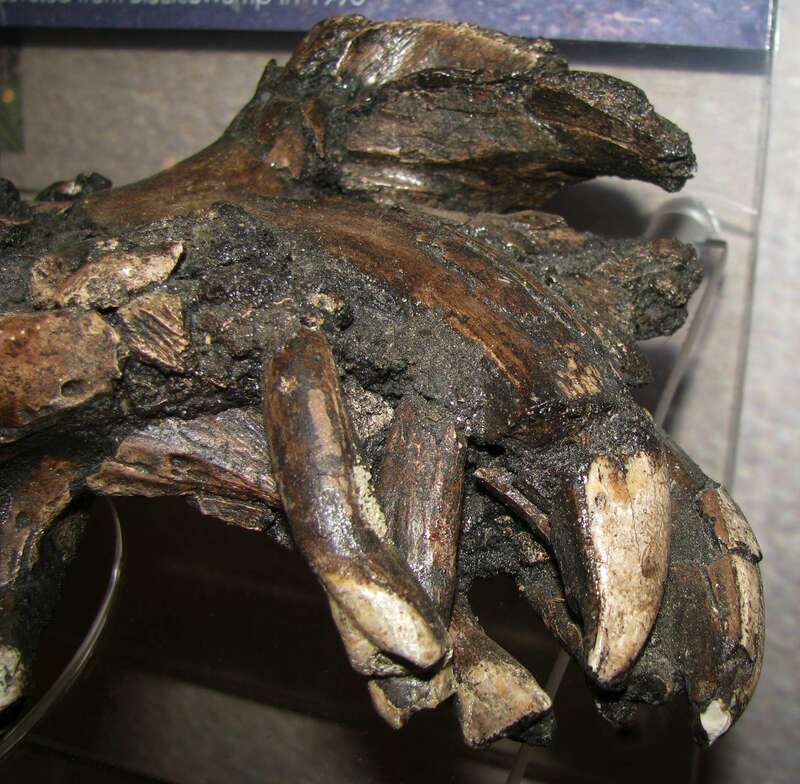 The most recent fossils of Zygomaturus have been dated to 19 000 years ago. Thylacoleo carnifex is commonly referred to as a marsupial lion, because of the cat-like nature of its skull and its flesh-eating habit. 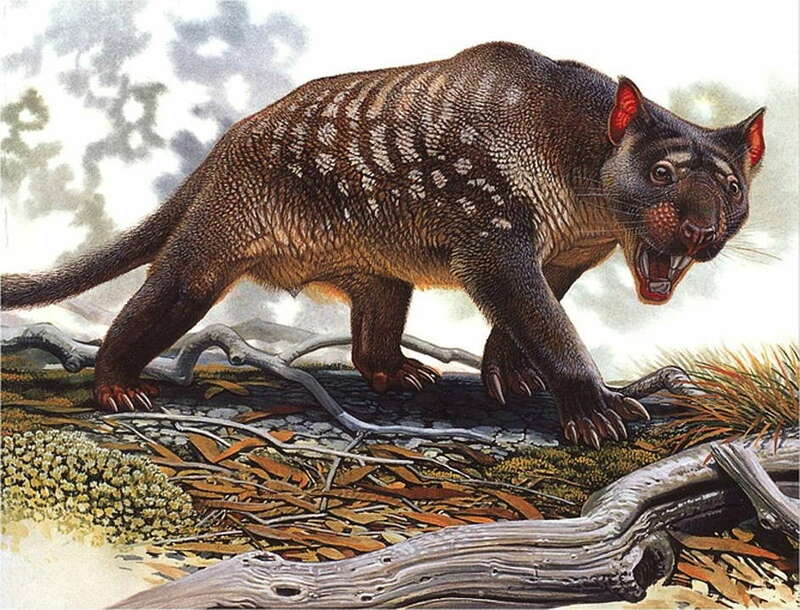 They were common across most of Australia during the Pleistocene period, and became extinct about 18 000 years ago. 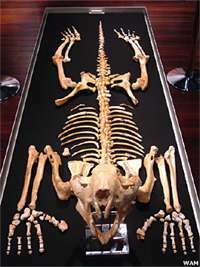 Procoptodon goliah was the largest of the late Pleistocene extinct sthenurine kangaroos. 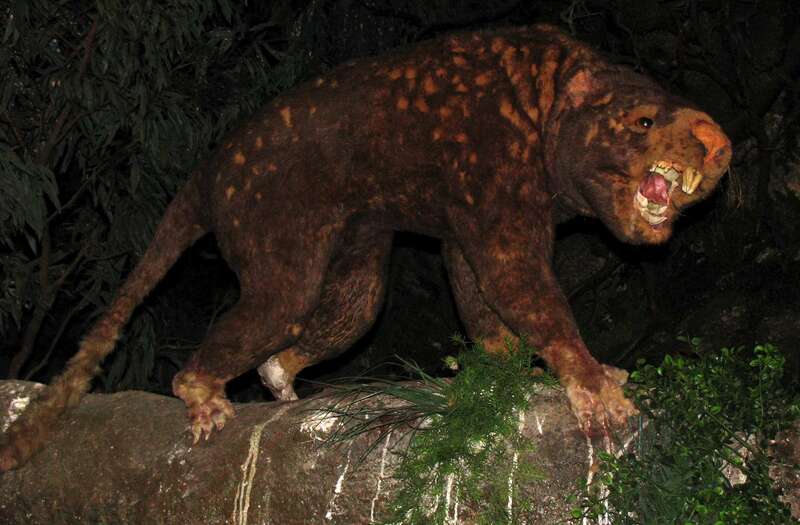 Balancing on its hoof-like fourth toes and propped up by its tail, Procoptodon could reach leaves more than three metres above the ground. The Thylacine's principal habitat was open forest and woodlands. 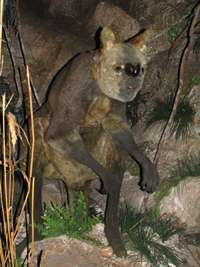 It hunted at night, its major source of food being kangaroos and wallabies. The last Thylacine died in captivity in 1936. Sarcophilus harrisii is now found only in the dry, sclerophyll forests and coastal woodlands of Tasmania. Fossil evidence indicates that this marsupial previously ranged over many parts of mainland Australia. 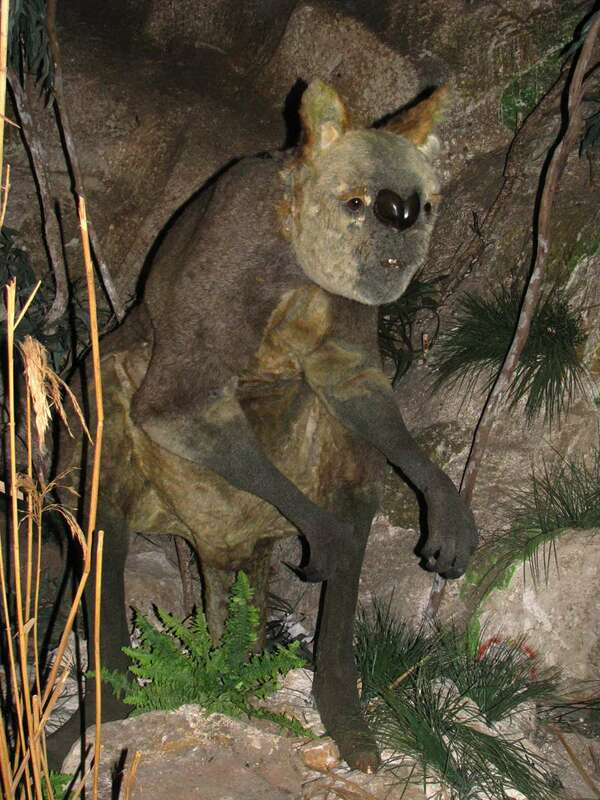 It is a nocturnal hunter and is the largest of the living marsupial carnivores. Megalibgwilia ramsayi, unlike the modern echidna, which eats mainly ants and termites, was able to consume larger fare such as grubs, beetles and worms. 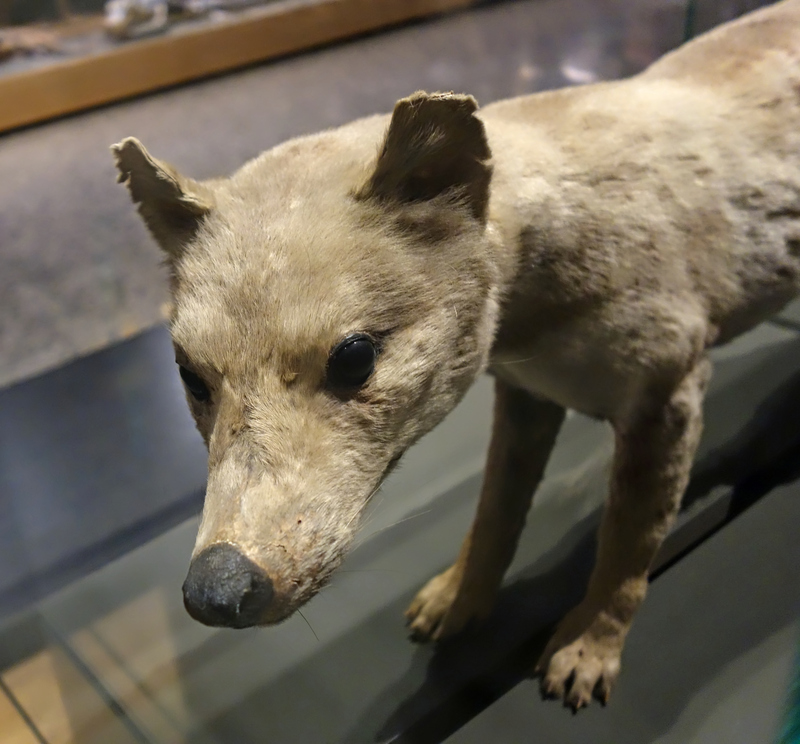 Megalibgwilia lived during the Pleistocene period, becoming extinct about 20 000 years ago. 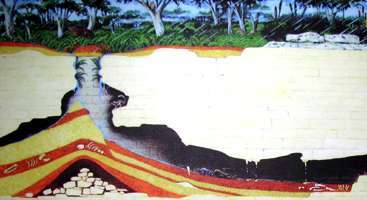 Artwork and text adapted from: Display, Naracoorte Caves, South Australia, and Wikipedia. These pie charts represent the composition of the 99 species of fossil fauna so far collected from Victoria Fossil Cave and now known to be more than 200 000 years old. Almost half are grazing or browsing animals. Approximately one third are extinct. 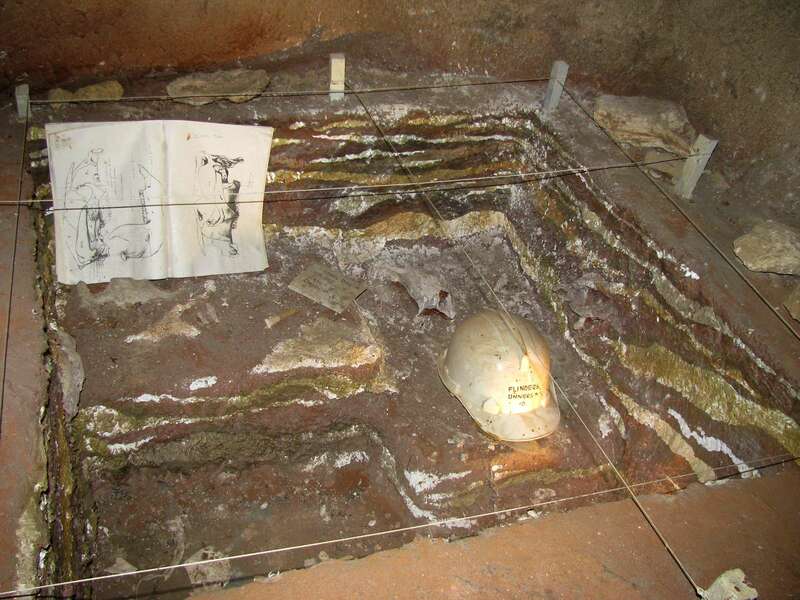 This poster shows the processes involved from discovery of a fossil to its presentation as a model in a diorama. After gently brushing away the sediment the position of each fossil bone is carefully recorded before removal. 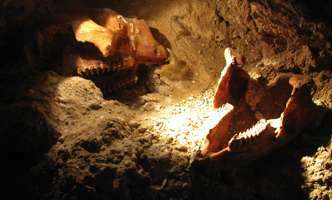 The fossils are removed to a laboratory for further treatment and analysis. 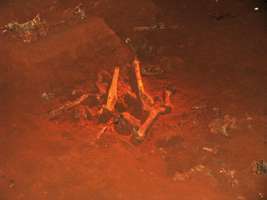 Once the bones have been identified and associations determined, scientists can begin to reconstruct the skeletons. 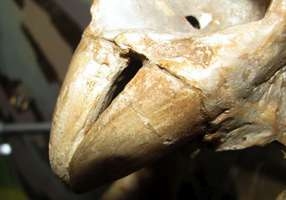 The muscles are reconstructed on the assembled skeleton. Once the musculature is complete, skin, fur, eyes and ears can be added. 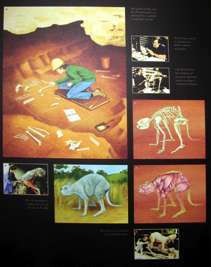 A recreation of an exploratory dig at Victoria Fossil Caves. The Tasmanian Tiger originally occurred on the mainland of Australia as well as the present island of Tasmania. 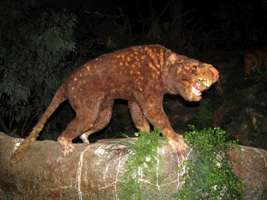 Resembling a cat, the predator had a pattern of 13 to 19 dark brown cross bands on the posterior back. The female had a pouch that opened to the rear, contained four teats, and served to nurse her young to their third month of life. In Australia, the Dingo probably replaced the Tasmanian Tiger several thousands of years ago, while it continued to exist in Tasmania until into the 20th century, since by that time Bass Strait had filled with sea water with the end of the last ice age and the rise of the oceans, around 10 000 years ago. Tasmanian Tigers were accused of killing sheep and therefore were rigorously hunted. In 1830, the authorities even offered a bounty for every individual killed. The truth was, however, that Tasmanian Tigers ate mainly native animals and birds. By 1910, the species had become very rare. The last individual in the wild in Tasmania was seen in 1933, and the last captive individual died in the Hobart Zoo in 1936. 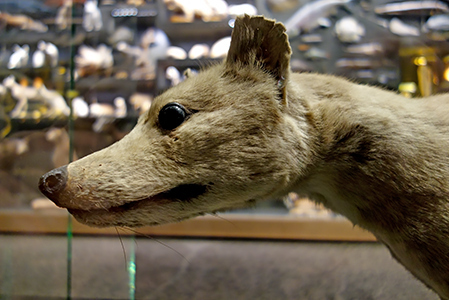 Aside from body parts that have been preserved individually, there are about 100 complete stuffed specimens and 28 mounted skeletons available worldwide. 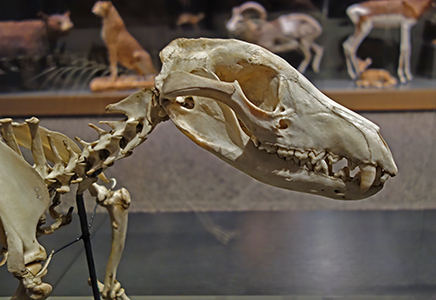 Tasmanian Tiger skeleton, close up of the top of the skull. Tasmanian Tiger skeleton, close up of the head. 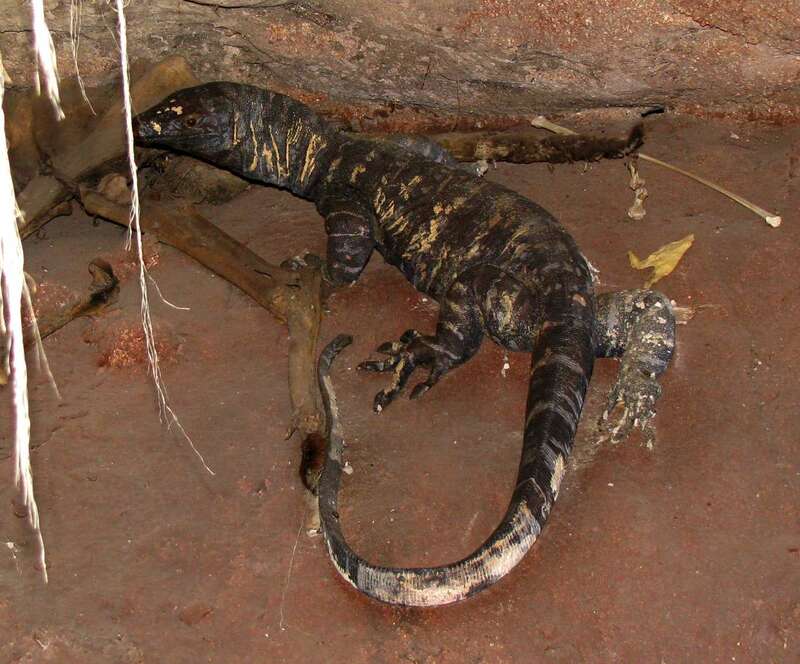 Goannas are good climbers, and were able to enter and leave the cave at will. They were scavengers, cleaning up animals which had fallen in to the pit trap and died. The caves would have been a good source of food for them, rather like a fast food restaurant. 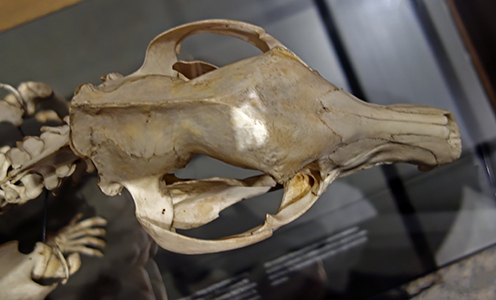 Skull and jaw of the extinct Short Faced Kangaroo, Simosthenurus occidentalis. After surviving the fall into the cave, it has crawled off and perished. 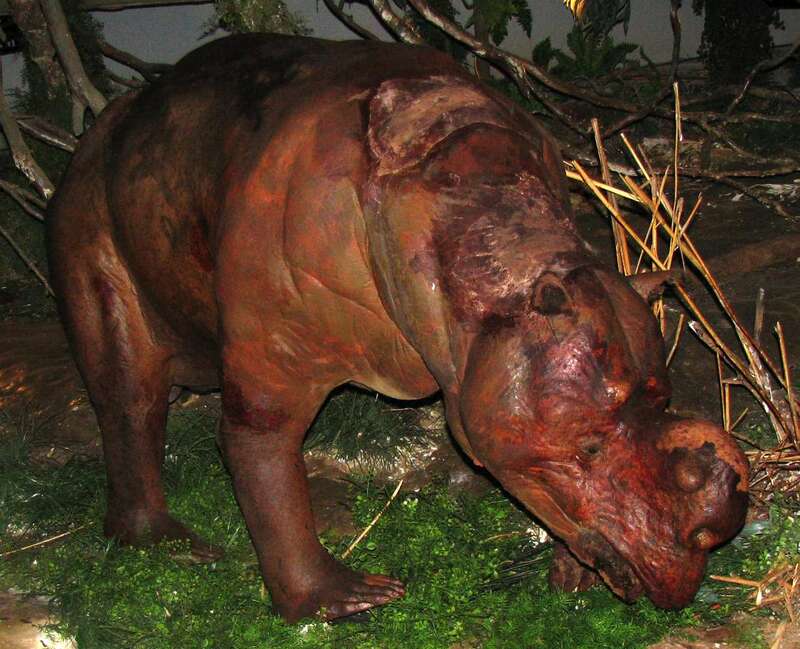 Simosthenurus occidentalis weighed over 118 kilograms (Helgen, 2006). The tongue of Palorchestes azael was long and ribbon-like. Owls swallow their food whole, and regurgitate what is not nutritious in the form of "owl pellets". Bones in these pellets contribute to the fossils found in the cave. Wonambi naracoortensis - a five to six metre long snake. Wonambi seems to have been an ambush predator. Rather than using venom, the animal would kill its prey by constriction. 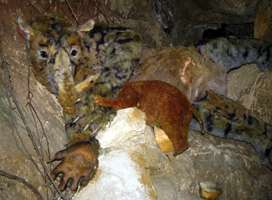 The head of the animal was small, restricting the size of its prey. 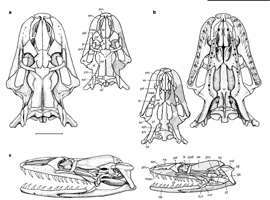 Reconstruction of the skull of Wonambi naracoortensis Smith, 1976.
a, Dorsal, b, palatal and c, lateral views. Small outline drawings indicate parts known in W. naracoortensis (stipple) and in W. barriei (cross-hatching). Scale bar, 30 mm (based on the largest known individual at type locality, FU1762). 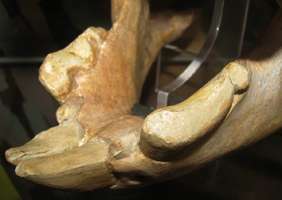 bo, basioccipitial; ec, ectopterygoid; cor, coronoid; de, dentary; fr, frontal; ju, jugal; max, maxilla; na, nasal; op, opisthotic; pal, palatine; pa, parietal; pm, premaxilla; prf, prefrontal; pob, postorbital; pof, postfrontal; pro, prootic; pt, pterygoid; qa, quadrate; sm, septomaxilla; so, supraoccipital; sph, sphenoid; sur, surangular; sut, supratemporal; vo, vomer. 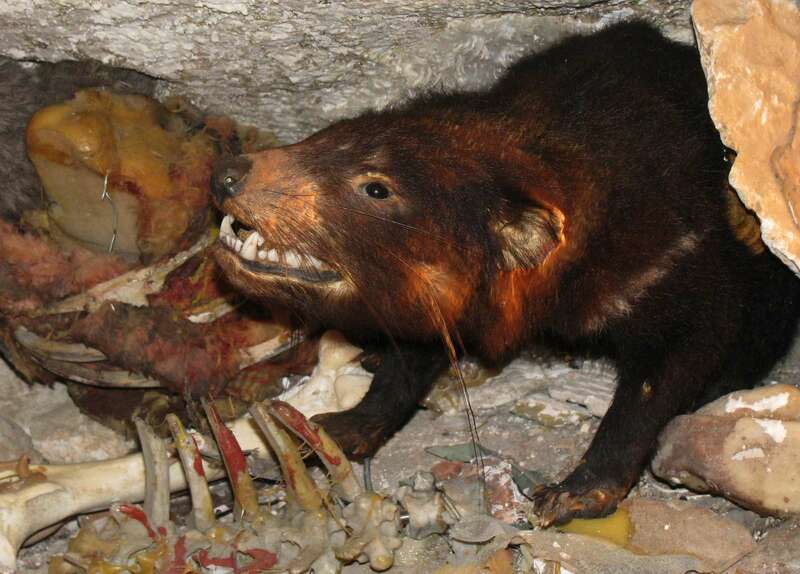 Scavengers such as the Tasmanian Devil shown here seize their chance for an easy meal on a short-faced kangaroo, a pitfall victim. The Tasmanian Devil (Sarcophilus harrisii) is a carnivorous marsupial now found in the wild only in the Australian island state of Tasmania. The Tasmanian Devil is the only extant member of the genus Sarcophilus. 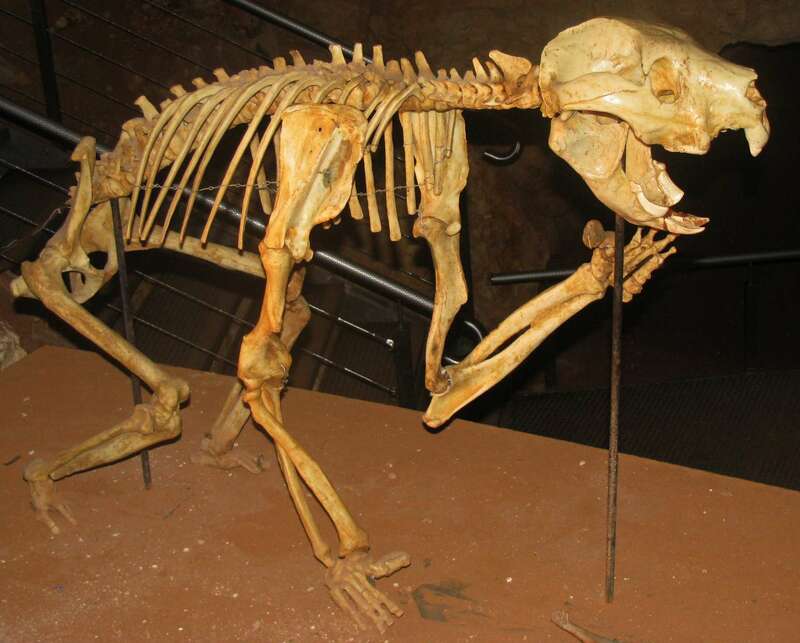 The size of a small dog, but stocky and muscular, the Tasmanian Devil is now the largest carnivorous marsupial in the world after the extinction of the Thylacine in 1936. It is characterised by its black fur, offensive odor when stressed, extremely loud and disturbing screech, and ferocity when feeding. It is known to both hunt prey and scavenge carrion and although it is usually solitary, it sometimes eats with other devils. The Tasmanian Devil became locally extinct (extirpated) on the Australian mainland about 400 years before European settlement in 1788. Because they were seen as a threat to livestock in Tasmania, devils were hunted until 1941, when they became officially protected. 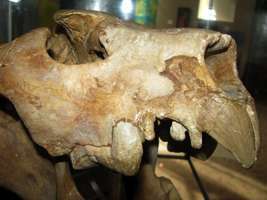 Since the late 1990s devil facial tumour disease has reduced the devil population significantly and now threatens the survival of the species, which in May 2009 was declared to be endangered. Programs are currently being undertaken by the Tasmanian government to reduce the impact of the disease. 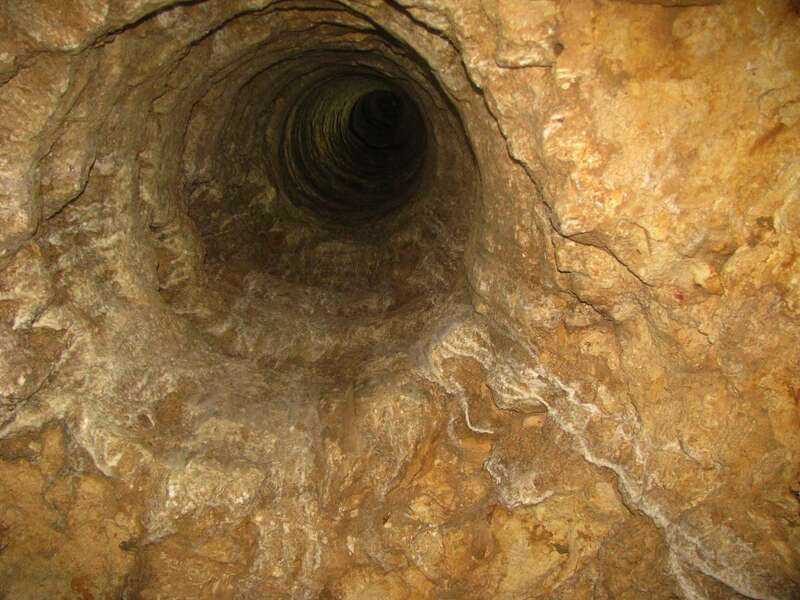 This horizontal gap, apparently narrower than the human body, was the original entry point for the cavers who first found and explored the cave system. You would have to be immune to claustrophobia to be a caver, I think! When it was realised what potential the caves had for tourists, a new opening to the cave system was dug. 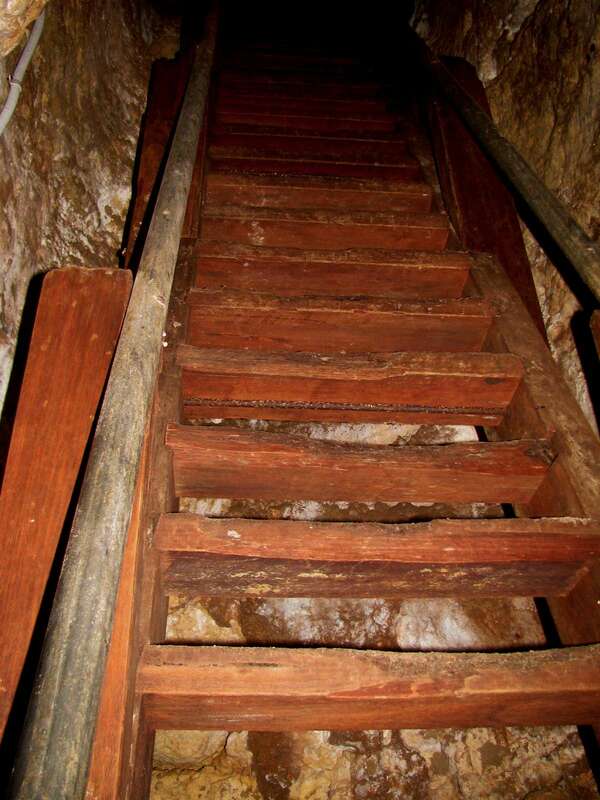 The original entry for the public was down this very steep wooden staircase. Looking like a large jewel, this slice of a stalagmite is both beautiful and instructive. Stalagmites grow from the floor of the cave, stalactites from the roof, so the youngest part of the stalagmite is at the top. This part of the slice took more than 200 000 years to form. Longitudinal slice through the centre of Stalagmite SCC-2. 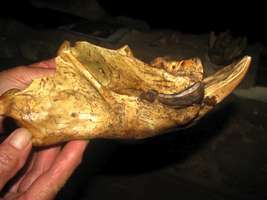 This specimen is part of a group of three stalagmites found broken on the floor in Starburst Chamber, Victoria Fossil Cave. They were collected for dating and palaeoclimatic work. SCC-2 is a 1.5m tall uniform diameter stalagmite broken in 3 separate sections. The slice presented here comes from the middle section of the specimen. 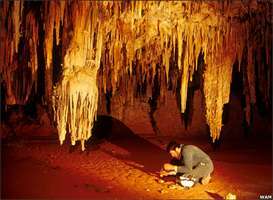 Stalagmites grow by the successive accumulation of discrete layers of calcium carbonate deposited on top of each other. In the specimen, the growth layers are visible as inverted cup shaped light and dark bands. The orange colouration of the specimen comes from the inclusion of soil organic matter in the calcium carbonate. 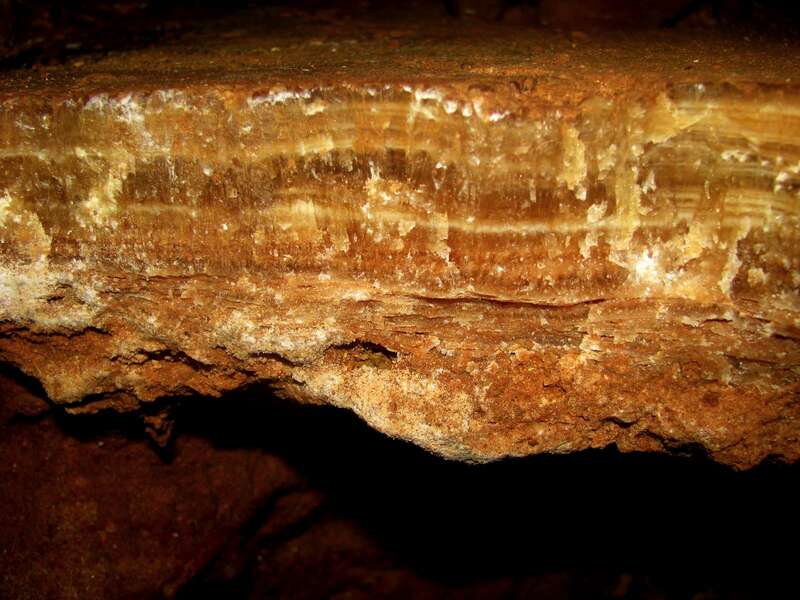 The organic matter is present in the drip water feeding the stalagmite, and is trapped in the clacite as it is precipitated. 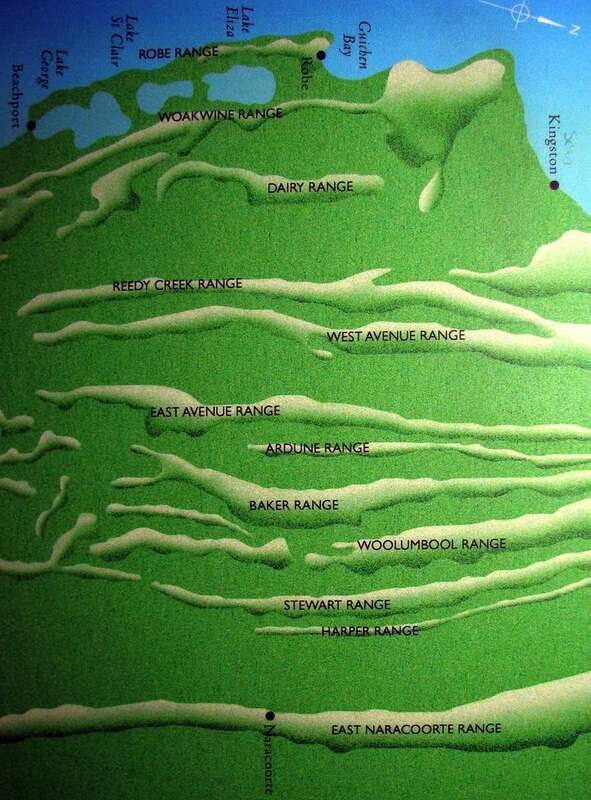 Darker layers contain more organic matter. There are two distinct growth phases in the specimen. The break in deposition is visible in the bottom section of the slice as a distinct lateral shift in growth layers. 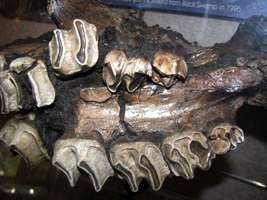 The fractured surface at the base of the specimen (5 mm thick slice) was found to be beyond the range of the Uranium/Thorium dating method, indicating that the base of the specimen is older than 500 000 years. The layer immediately above the break in deposition (hiatus) was dated at 282 477 ± 8 962 years. The very thin surface between the older core and younger growth therefore represents a break in deposition of over 220 000 years. The top fractured surface of the slice was dated at 290 567 ± 7884 years. 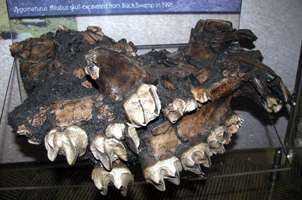 Although this age appears older than the base, the ages are well within the error of each other, indicating that the growth of the specimen over this interval was much faster than can be resolved by dating methods. The very top section of SCC-2 (not presented here, 50 cm above the top of the slice) was dated at 277 263 ± 10 542 years. 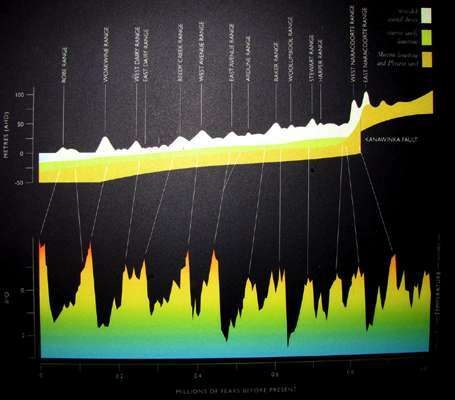 The steady accumulation of dunes, the changing climate and local conditions, and the advance and retreat of the sea during glacials and interglacials to the present day. 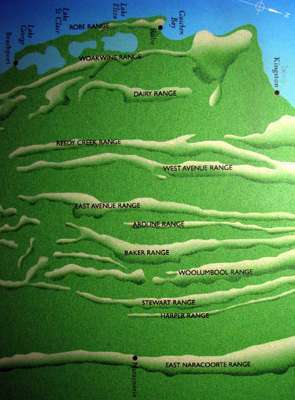 A map of the dunes in the Naracoorte area. Temperatures have varied greatly over millions of years, as the glaciers advanced and retreated in the Northern Hemisphere, and in parts of South America and Australia. 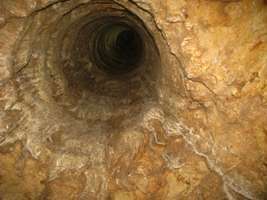 This hole was drilled in the roof to allow concrete to be pumped in in order to seal the floor in the Victoria Fossil Caves. 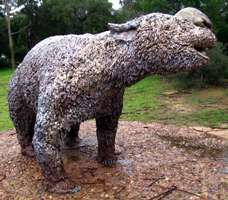 Diprotodon sculpture in the gardens of the Naracoorte Caves. 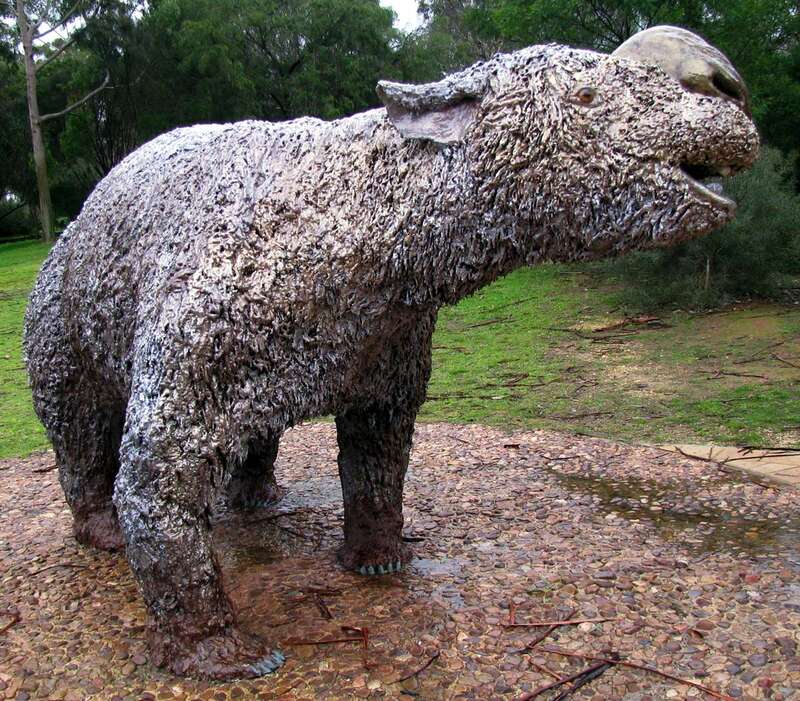 Perhaps the sculptor had a good reason for showing the diprotodon with a wooly coat, but I can't help feeling that a hairy coat like a horse or a cow or a kangaroo would be more likely. 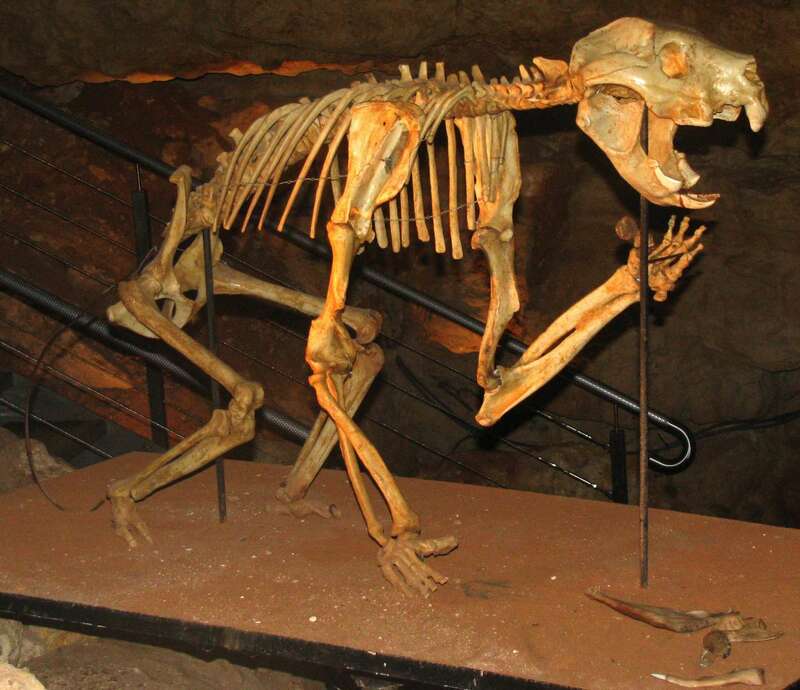 A recreation of the Marsupial Lion, Thylacoleo carnifex, at the Naracoorte Caves display. 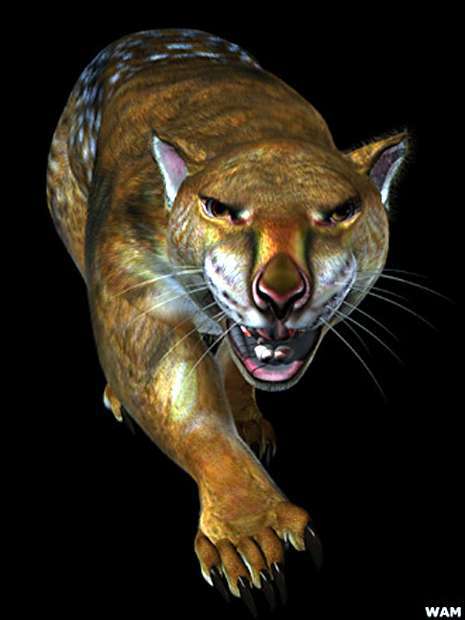 This is the best image I have seen of the Marsupial Lion, by Peter Schouten, a wonderful wildlife artist. He did a fantastic recreation of the 'hobbit', Homo floresiensis . This photo (right) gives a good idea of the relationship between the jaw of a marsupial lion as compared to the size of a human hand. 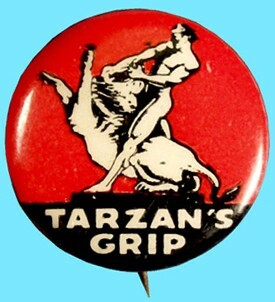 It would not have been a good idea to be as up close and personal as this, trying to do a "Tarzan" impression, holding open the lion's jaw with your bare hands, as I remember from the logo (left) for the Australian glue, Tarzan's Grip! It is close up photos like this that bring home how much facsimiles have improved over the years. The wealth of fine detail, and the superb colouring of modern museum quality facsimiles are a credit to the artisans responsible. 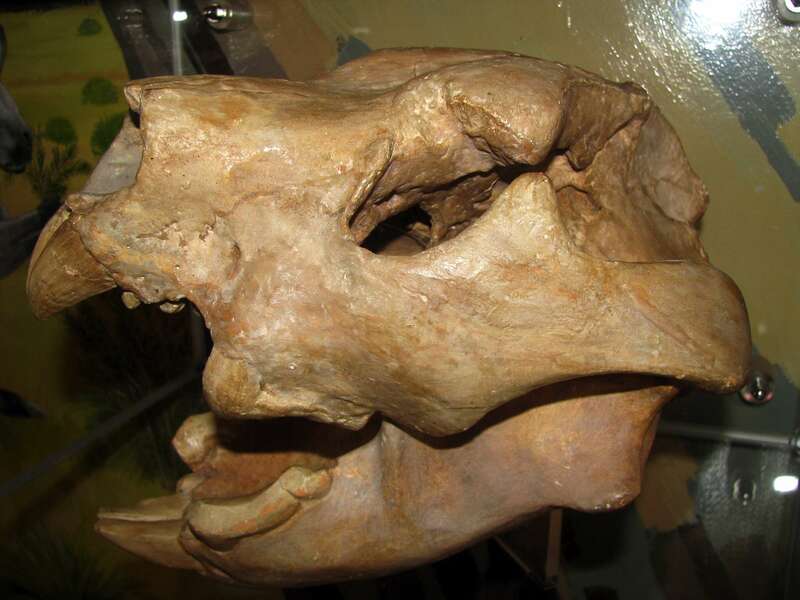 Zygomaturus trilobus had a size and build similar to a pygmy hippopotamus, weighing around 300 to 500 kg. 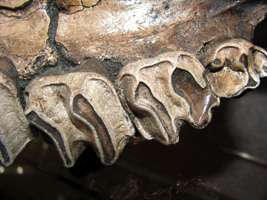 The scientific name refers to the broad zygomatic arches (cheek bones) and the three prominent lobes of the premolar teeth. 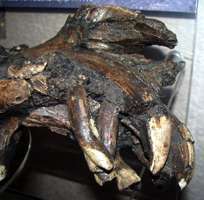 Some of the features of its skeleton suggest it may have preferred swampy habitats. 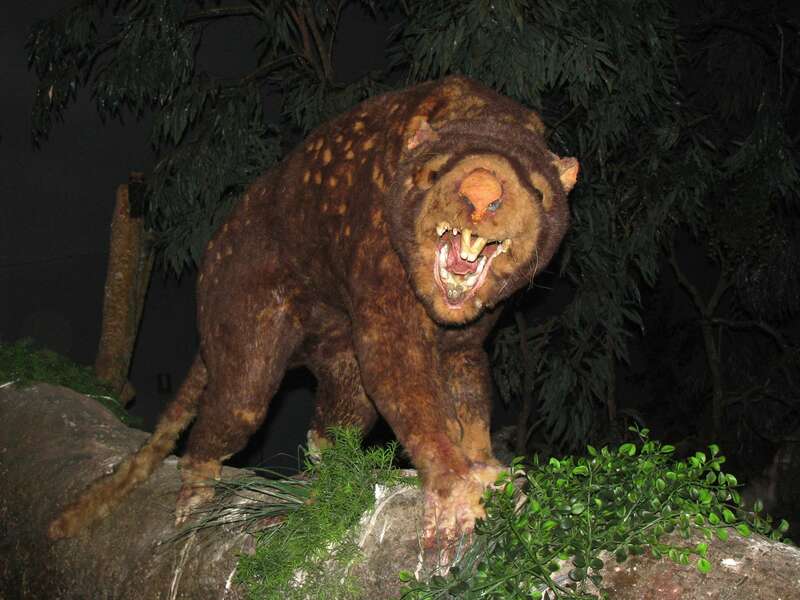 It possibly lived in small herds around the wetter, coastal margins of Australia and occasionally may have extended its range along the watercourses into central Australia. A ground dweller, it moved on all four limbs. 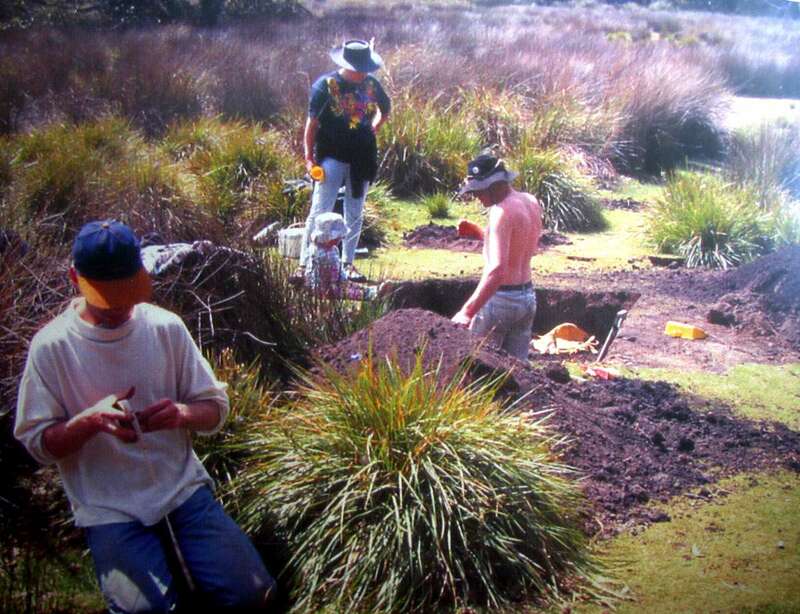 Digging at Black Swamp, Kangaroo Island, 1996. 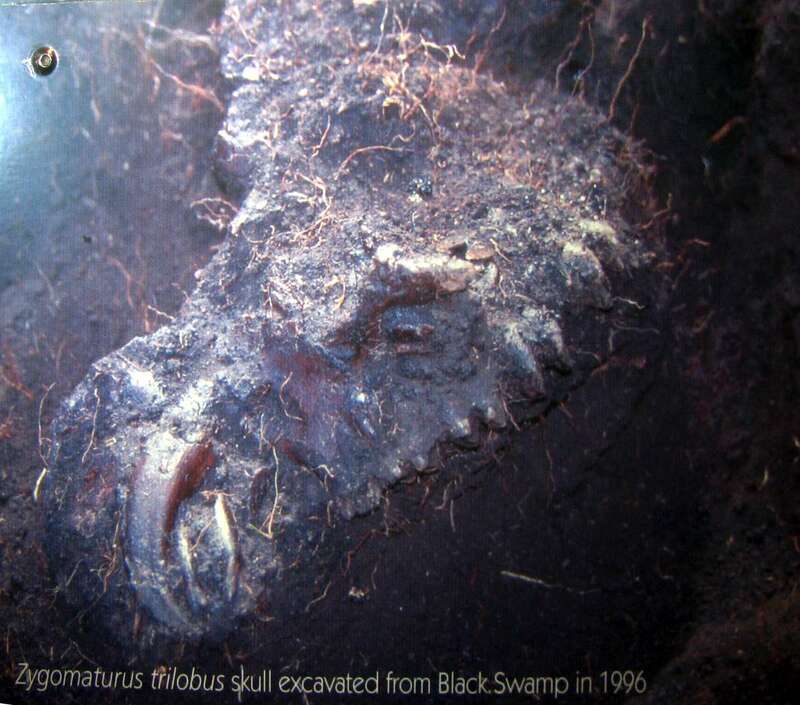 This dig exposed the fossils of the swamp cow, Zygomaturus trilobus. The skull of the swamp cow, Zygomaturus trilobus found at Black Swamp. A recreation of the swamp cow, Zygomaturus trilobus at the Naracoorte Caves display. An astonishing collection of fossil animals from southern Australia is reported by scientists. 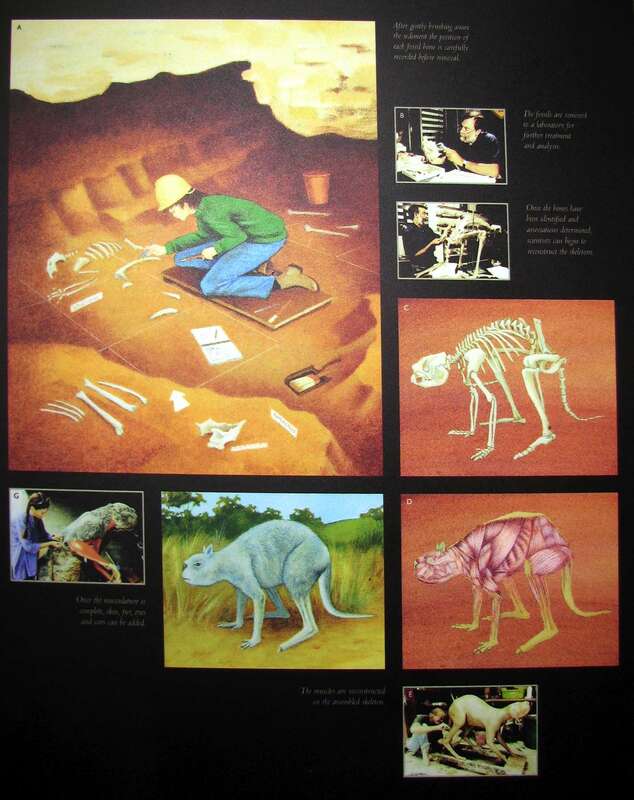 The creatures were found in limestone caves under Nullarbor Plain and date from about 400 000-800 000 years ago. 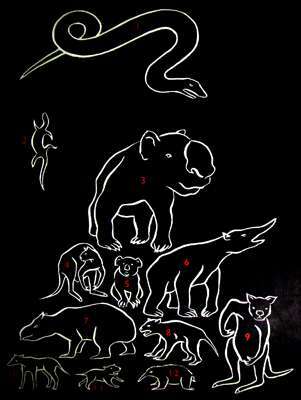 The palaeontological "treasure trove" includes 23 kangaroo species, eight of which are entirely new to science. 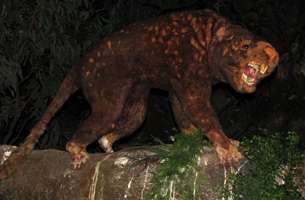 Researchers tell Nature magazine that the caves also yielded a complete specimen of Thylacoleo carnifex, an extinct marsupial lion. It appears the unsuspecting creatures fell to their deaths through pipes in the dusty plain surface that periodically opened and closed over millennia. Most of the animals were killed instantly but others initially survived the 20m drop only to crawl off into rock piles to die from their injuries or from thirst and starvation. The preservation of many of the specimens was remarkable, said the Nature paper's lead author, Dr Gavin Prideaux. "To drop down into these caves and see the Thylacoleo lying there just as it had died really took my breath away," the Western Australian Museum researcher told the BBC's Science In Action Programme. "Sitting in the darkness next to this skeleton, you really got the sense of the animal collapsing in a heap and taking its last breath. It was quite poignant. 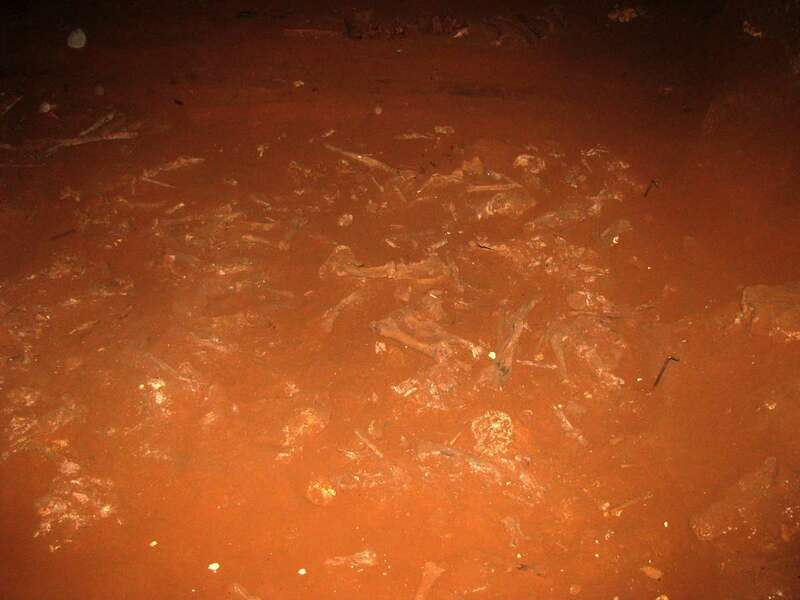 "Everywhere we looked around the boulder piles, we found more and more skeletons of a very wide array of creatures." In total, 69 vertebrate species have been identified in three chambers the scientists now call the Thylacoleo Caves. These include mammals, birds and reptiles. The kangaroos range from rat-sized animals to 3m (nearly 10ft) giants. 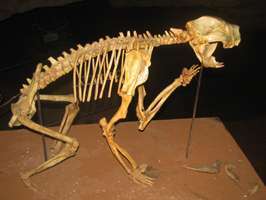 The Marsupial Lion (Thylacoleo carnifex, the "murderous (or 'meat-cutting') marsupial lion" from thylakos - pouch, leo - lion, carnifex - murderer, tormentor, 'butcher') is an extinct species of carnivorous marsupial mammal that lived in Australia from the early to the late Pleistocene (1 600 000 – 46 000 years ago). 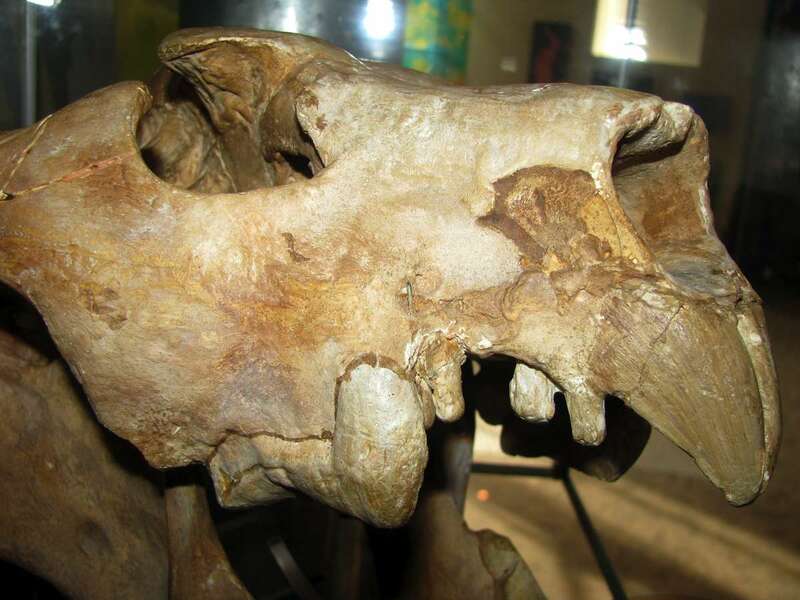 Despite its name it is not closely related to the Lion, but is a member of the order Diprotodontia. Helgen, K.M., Wells, R.T., Kear, B.P., Gerdtz, W.R., and Flannery, T.F. (2006). 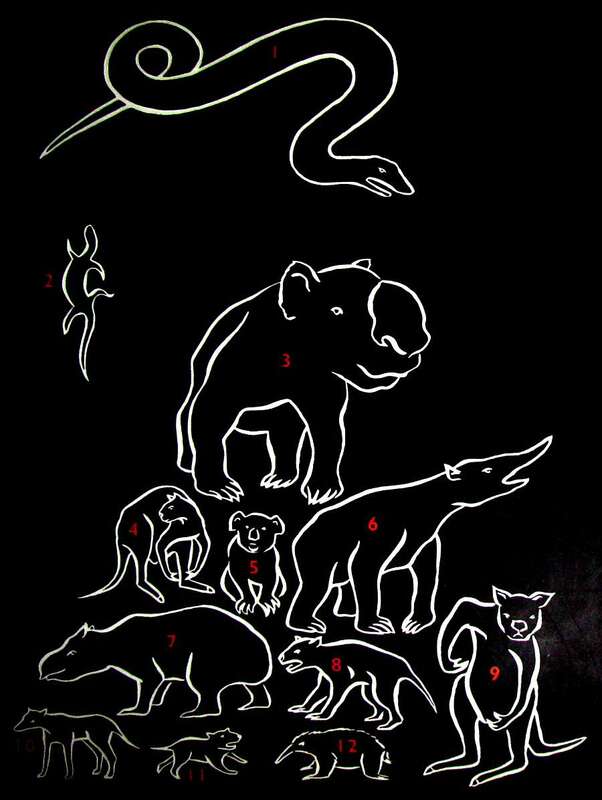 "Ecological and evolutionary significance of sizes of giant extinct kangaroos". Australian Journal of Zoology 54: 293–303. Palmer, D. ed (1999). The Marshall Illustrated Encyclopedia of Dinosaurs and Prehistoric Animals. London: Marshall Editions. p. 205. ISBN 1-84028-152-9.